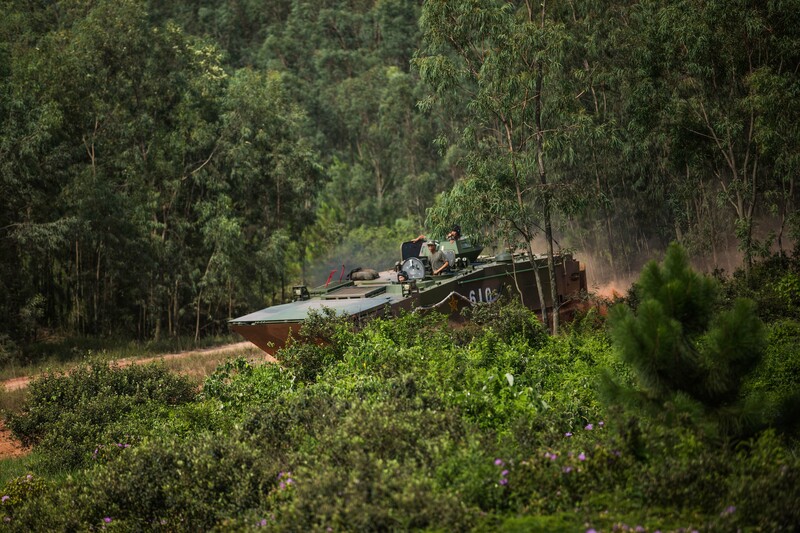 On June 30 the Chinese army’s official newspaper released photos from a small-scale exercise in Guangdong Province where different armored vehicles were being put through their paces. Soldiers from an unspecified unit of the 74th Group Army were pictured driving two vehicles through open jungle terrain. One of them was identified as the Type 001. Larger than most of the PLA’s tracked armored vehicles, it’s operated by a driver and two crew members. Judging by its appearance the Type 001 is an amphibious APC meant for transporting marines to shore. 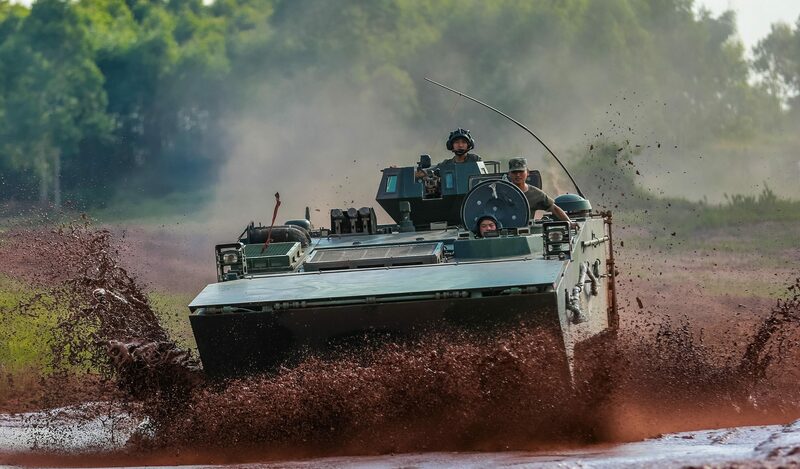 Having faced off against Taiwan for more than half a century the PLA maintains a persistent requirement to deploy amphibious vehicles. Back in the 1960s this was somewhat fulfilled by the Type 63 light tank for accompanying troops as they assaulted a beach. During the 1980s the PLA received locally made copies of the BMP-1. But it was in the turn of the century when the PLAN’s small marine contingent received special purpose vehicles. Norinco managed to improve the Russian BMP-3 and this resulted in the ZBD-04. The same vehicle was later redesigned as a tank destroyer to supplement the aging Type 63’s. The ZBD-05, also known as the ZTD-05, the ZBD 2000, and the ZND 2000, is an amphibious tank destroyer built in limited numbers. The hull was elongated to accommodate a wide bow that supported the trim vane. Rather than an infantry transport, the internal space was used to fit an angular turret armed with a 105mm gun. This gave the resulting ZBD-05/2000 a distinct advantage over the American AAV-7–it could fight and kill other armored vehicles. For marine infantry, the ZBD-05 had a variant, armed with 30mm cannon and missile launcher, offering sufficient space for a squad. While its sibling the ZBD-04/08 is a better fit as a marine battle taxi it just hasn’t been committed to the role. Even the very capable ZBL-09 isn’t being produced in sufficient numbers to do the same. Perhaps a reason why is the PLAN lacks proper assault ships, LPD’s, and LHD’s for moving enough of these vehicles. It appears the new Type 001 utilizes the same hull as the ZBD-05. But this time the main armament is removed in favor of a basic 12.7mm machine gun housed in a pivoting cupola. The telling details are its layout, with the driver and commander seated lengthwise beside the engine compartment. 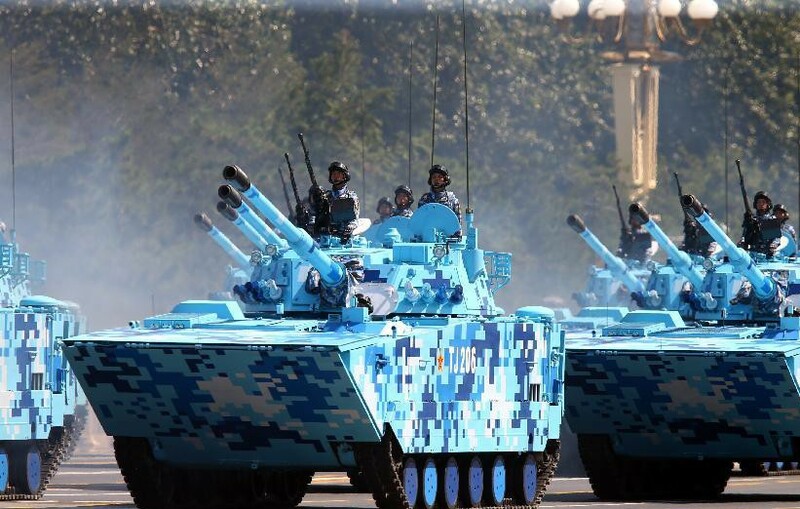 It was indicated the Type 001 was accompanied by a ZBD-05 in IFV configuration during its driving test. Both APCs were revealed just weeks after photos and video of a prototype Japanese amphibious transport went viral. A scale model of the same was later put on display at the recent MAST Asia 2017 naval show in June. Too little is known about the Type 001’s characteristics–from its engine type, weight, and armor level–to write substantially on its finer details. Keeping in mind the PLA’s goal of organizing a 100,000-man expeditionary branch, it isn’t surprising a proven vehicle is being tailored to suit these newfangled marines.